The Mail Department processes all campus mail, excluding student mail*. We are located in Building 96, directly to the north of Facilities Management, on the corner of B and 14th streets. When mailing letters or packages through the USPS, please provide your department's name and PeopleSoft Department ID. Please have your mail to the mail room by 3:00 pm. When shipping packages through UPS, please provide the recipient’s address, phone number and PeopleSoft chartfield. For International shipping, please provide the recipient’s phone number, address, zip code, description of contents. If you want to insure your package please include the value of the content you are shipping. All packages must be to Shipping & Receiving by 2:00 pm. Faculty and Staff are reminded that State resources may not be used for personal inbound or outbound mail or freight. Distribution Services handles official business mail & freight only. This includes U.S. Mail, UPS, overnight express carriers, and on-campus mail. Distribution & Mail Services cannot accept pickup, or deliver personal or unofficial mail. 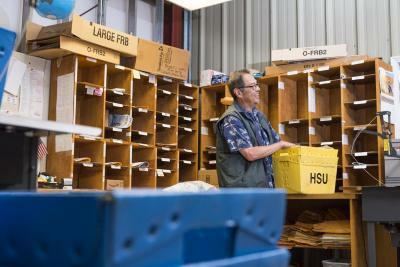 Non-university related items and/or personal items should not be sent to Humboldt State University and may be refused by Mail & Distribution Services. Outgoing personal mail should not be directed through Mail & Distribution Services. Personal mail will be returned to the sender if the origin can be determined without opening sealed envelopes. For your personal mailing convenience, there is an outgoing USPS Mail Box located next to the BSS building on Harpst Steet.